A launch to the season of golden slanting sun and naturally tinting leaves, here is a seasonal selection of commentaries voted the best at Light Project studio — a visually warm celebration of the coming cool weather. It’s autumn in New York, The gleaming rooftops at sundown, Oh Autumn in New York, It lifts you up when you run down. Glittering crowds and shimmering crowds, In canyons of steel, They’re making me feel – I’m home. 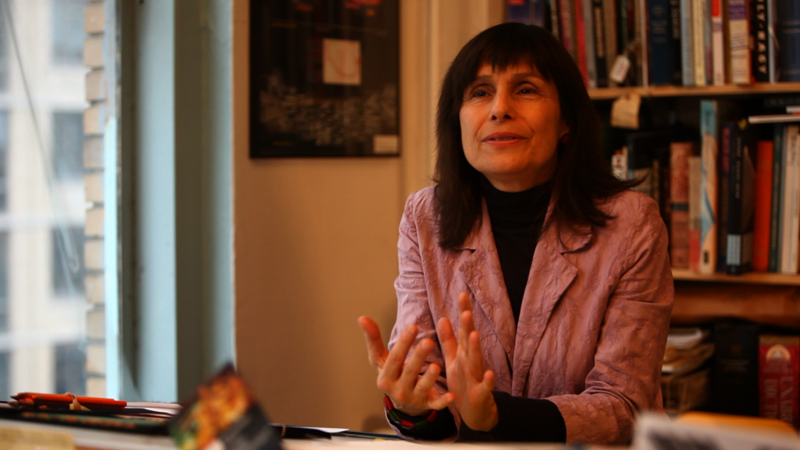 An interview about urban lighting of our city as room, the body; home to the heart. 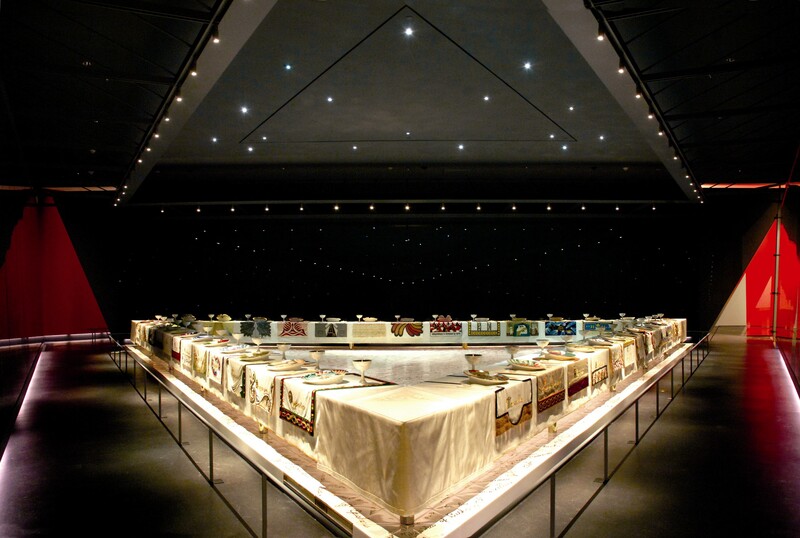 Sackler Center, Brooklyn Museum; Judy Chicago's Dinner Party. Light Projects worked closely with Ennead architects. This interactive light/art/science sculpture is an public outreach artwork created to explain gravity. Publicolor is our favorite non-profit. We illuminate their benefit in a high-school gym annually. HTO Park and Bryant Park, two great urban public spaces. Which is your favorite Leni Schwendinger, Fusing Art + Design with Light post? SpectraScape, the public art installation comprised of video bands of light that scroll across the green glass shelters at Main Street Garden Park will shift from the spring colors – hot pinks and white – to summer soft pink, lavender and yellows – on June 21, as the Summer Soltice transpires. On Tuesday evening viewers will see a dynamic media transmission echoing the summer landscape of the garden park. DESIGN PROCESS: Preliminary Spring to Summer colors. Here, a silent film of the design and construction process: SpectraScape – an Interactive Artwork Under Construction. The project progressed from construction to video and seasonal programming, shown in this short video: SpectraScape – On-site Programming. In the end, a crowded and joyful opening event included my talk on Dallas Main Street Garden Park – Ribbon Cutting. SpectraScape, inspired by the colors of the seasonal foliage in Main Street Garden Park, interacts with park visitors when they enter the green glass shelters. The horizontal scroll of color freezes as interior lights illuminate the shelter space when visitors step in. The presentation of Spring in SpectraScape is best viewed just after dusk, which is clearly identified by the white color bands that identify the 30 minutes of sunset before resuming with the seasonal rhythmic flash of color that races across the top of the shelter. This work inhabits the City’s first urban park landscape in central Dallas, Main Street Garden Park located between Commerce and Main and St. Paul and Harwood streets. With over twenty years of work as both lighting designer and public artist, Leni has developed her lighting philosophy and in doing so, has refined the possibilities for light in the urban environment. 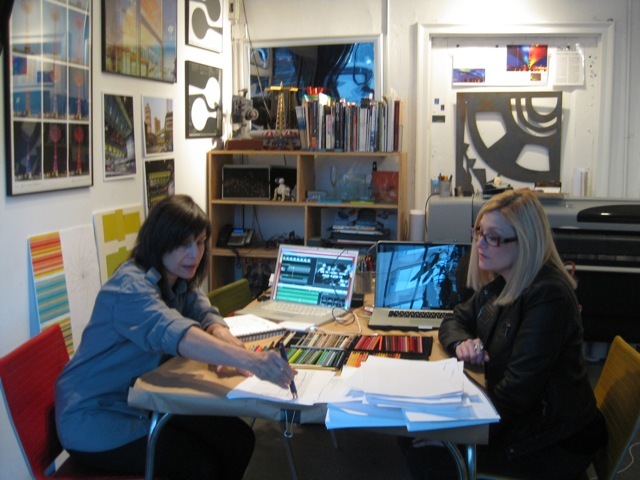 She has been the recipient of numerous professional awards, including several “Lumen” awards from the Illuminating Engineering Society, the Society for Environmental Graphic Design and the NYFA Fellowship for emerging and media art. The City of Dallas Office of Cultural Affairs (OCA) works to enhance the vitality of the City and the quality of life for all Dallas citizens by creating an environment wherein arts and cultural organizations can thrive so that people of all ages can enjoy opportunities for creative expressions and the celebration of our community’s multicultural heritage. Our mission is to establish a cultural system that ensures that ALL Dallas citizens and visitors have an opportunity to experience the finest in arts and culture. More information on the programs and services provided by the OCA can be found at www.dallasculture.org. Visual memories of December 2010 are clothed in a vapor of magenta pink. 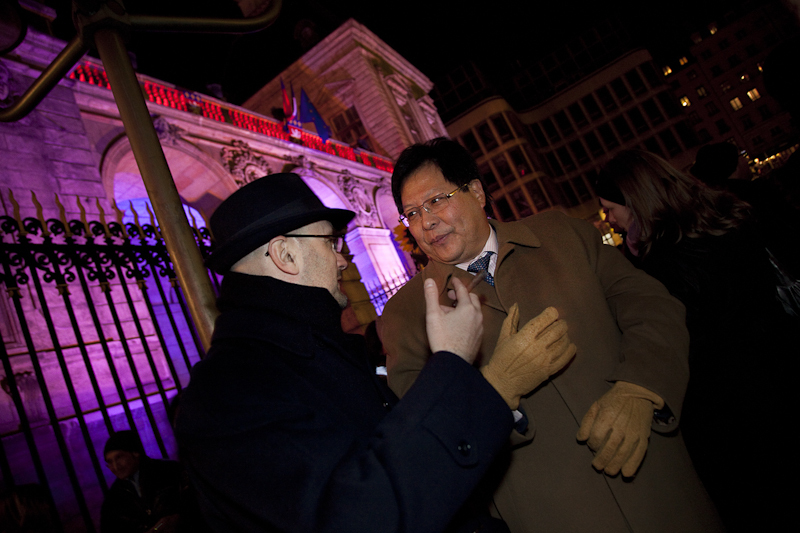 During the famous ‘Fête des Lumières‘ in December 2010, Philips International Communications invited me to join their Livable Cities event. The event consisted of a panel, dinner and a LightWalk amongst the winding streets of Lyon to directly engage and educate international journalists on issues of lighting in the nighttime environment. Lyon is the third largest city in France. It is located between two rivers—Rhône & Saône—and is defined by rocky cliffs, castles and Roman ruins. Lyon’s Light Plan, the permanent illumination of more than 200 buildings and public places, was established in 1989. I had the opportunity to visit the city in 1995 and viewed the lighting strategy from which the Lighting Urban Communities International organization, (LUCI), was born. Fête des Lumières spans four days in early December each year. The celebration has grown into an international event, with light shows and exhibitions by international artists and students. Attendance is said to reach four-million visitors annually. Each year a color theme is implemented with filters on the streetlights. In 2010 the streets of Lyon were bathed in hues of magenta-pink. Now, as I write these words of recollection, my internal vision of the city of Lyon is drenched in this luscious color. sold street-side . As my companion observed, “I have never seen such crowds— except for sports or politics and here they all turn out for culture”. The first step in the coordination of a NightSeeing™ LightWalk is the planning of the route. Generally booked by a conference or educational organization, in preparation, I dialogue with the local representative to devise a diverse, architecturally stimulating 10-minute itinerary— which becomes an hour-long when implemented on the Walk. For the Fête des Lumières, planning counterparts were Lyonnaise tour guide, Anne Prost, and adviser Alexandre Columbani, general manager of LUCI. The festival has a sophisticated on-line presence with beautiful interactive maps and installation photographs. For weeks, I studied this swirl-framed program online program of the Fête. This historic city is dense with alleys and pedestrian passageways paved with stones and lined with facades spanning the centuries. Selecting the route in a city founded by Romans in 43 BC — and now lauded for innovation is daunting! One challenge was to the LightWalk participants from the dense crowds; another was to include just a few spectacles. After all, an important concept for my LightWalk is the “normal”, typical nighttime light of the city. I developed a tour starting at the Hotel De Ville (the local government seat). Alexandre, an inhabitant of Lyon, introduced me to the area known as Croix-Rousse, a UNESCO World Heritage Site, in which silk weaving industry was introduced in 1536. This industry shaped unique architectural forms, such as the traboules—public spiral staircases. Protesting the introduction of new technology that would cause unemployment, throughout the 19th century, the silk workers known as canuts revolted and rioted. Our guide Anne enumerated the local lore of the canuts and the silk suppliers to all of us—describing 16th through 19th-century psycho-geographical atmospheres and other facts that defined this district. In the cold magenta night we gathered at the Roman Arena with its spiral of candles. We traversed up and down Lyon’s ubiquitous public stairs to see illuminated fabric sculptures and stood on the edge of the public square viewing translucent structures back-lit with geometric projections; and gazed upon varied and colorful lit-up baubles suspended from trees, facades and fences. More traditionally illuminated cathedrals and facades were also dotted along the route. Between spectacles I indulged on of my professional and private passions—pointing out the pedestrian signals—civic “jewelry“ of the city night—brightly blinking, their pink and black grille-work shadows intermingling with the people who cast them, as well as the lighted shop windows and many other “found”, vernacular effects of the urban nighttime environment. The panel was located at the Philips Outdoor Lighting Application Centre in La Valbonne near Lyon. Starting of the day-long event, panelists Allan Stewart, Marco Bevolo, Dominique Mamcarz, Martin Lupton, Ken MacKenzie, Nicholas You, Rogier van der Heide, myself and Richard Griffiths, moderator, assembled in an intimate setting with reporters from media organizations from all over the world — including journalists from China, France, Italy, Korea, Singapore, Latvia, Spain and the United Kingdom — in the varied fields of business, technology and planning. Urban Well-being – enhancing health and well-being through the provision of safer streets, Branding & Identity – driving tourism, commercial growth, inward investment and civic pride, Urbanization – the challenges of urban population growth, including urban clutter, balance with nature and energy efficiency. “Haphazard planning, population growth and urban sprawl are taking a toll. If we continue at this rate, Asian cities would go the route of “maximum cities” where 20 million inhabitants (soon, this is the new “normal”) will fight for space to live, work and play. The message from the Lyon forum is simple: The only limit to creating great cities is your imagination. City planners, urban dwellers and governments all have a role to play by ensuring the development, projects and visions reflect exactly what the inhabitants want. For essays on public lighting theory – here. and lighting artist Leni Schwendinger. In 1993 Leni undertook a photographic research project in Japan, an exploration of ephemeral architecture and the “kare sansui”; Buddhist dry landscapes. Her medium, the short-lived black-and-white Polaroid transparency film, enhances the fragile atmosphere of her subject – ritual gardens and ever-changing earthen construction sites. The photographic slides were processed on the spot in Japan by a hand-powered, mechanical-cranked processing machine. Leni Schwendinger’s image montage, inspired her cousin, Laura Schwendinger, to create an orchestral world of shimmery sounds and intense dramatic orchestral shadings for the American Composers Orchestra. The orchestral colors reflect the duality present in Leni’s images. These include rich pearlescent tones, in shades of grey, found in the scenes of the serene Japanese rock gardens, as well as those found in darker more intense industrial images taken at nearby building sites. The duality presented in the projections, are reflected in the musical score’s two personas. These seemingly different qualities are intrinsically connected by the visual relationship of the two visual worlds. The tones of light, dark, grey and shadow, as well as the shapes present in both worlds, those of the gardens and of the industrial scenes, seem to carry the same mystery of geometry and space. In SHADINGS, Laura Schwendinger explores these connections and duality in an orchestral soundscape that attempts to amplify the beauty and wonder of Leni’s delicate and sensitive eye. The music will be completed only in the presence of the lighting and vice-versa. Unlike other recent multidisciplinary forays, this work seeks to be a true collaboration between these two artistic mediums, offering a door to a possible synesthetic connection between the two approaches, combining two different levels of perception – aural and visual. SpectraScape, the Public Art installation comprised of video bands of light that scroll across the green glass shelters at Main Street Garden Park will shift from the fall colors – rust and green – to winter on December 21, as the Autumnal Equinox transpires. On Tuesday evening viewers will see green and white tones of light that celebrate the sparse landscape of the garden park proclaiming the start of winter. The presentation of Winter in SpectraScape is best viewed just after dusk, which is clearly identified by the white color bands that identify the 30 minutes of sunset before resuming with the seasonal rhythmic flash of color that races across the top of the shelter. This work inhabits the City’s first urban park landscape in central Dallas, Main Street Garden Park located between Commerce and Main and St. Paul and Harwood streets. Here is a silent movie link shot in 2009: SpectraScape – On-site Programming. Dwell Magazine’s series, As You Light It <link here>, focuses on my idea of the City as home and the NightSeeing™ program. The video takes the viewer on a journey starting in the Light Projects LTD studio and on to the far west side of Manhattan, Triple Bridge Gateway at the bus terminal, Times Square and Bryant Park. Link to learn about my Public Lighting Theory and walk with me (and the camera) on Night City, a movie. CultureNow is focused on cultural mapping and exhibitions about New York City. They called the other day and asked if I would talk about my work for their “Museum Without Walls” directory of podcasts. The collection consists of first person discussions of art, architecture and other landmarks in the City.